You can make this recipe. Yes, even YOU. You know who you are. After having way too much construction in the house over the week, I had had enough. We had windows replaced, all 23 of them. Then the A/C went out and got replaced. I'm in South Florida. You need A/C. Then the window guy came back for a "Pick List" I am still waiting for him to finish. Cooking calms me. I tried doing what passes for work. I tried hitting some entertaining websites. I tried installing software on my server. After all that, the chocolate chips I bought at the Restaurant Wholesale store were too close to the crock pot when I made Barbecue Pork. The closest side melted into a solid mass. I needed to do something with that solid block of fused chocolate chips. I needed to make a treat. Let me tell you, this is some of the BEST fudge I have come across, and I have had some of the best that the New Jersey Shore has to offer. I mean Ocean City, NJ has some great fudge, but it is also 1000 miles away as the crow flies. 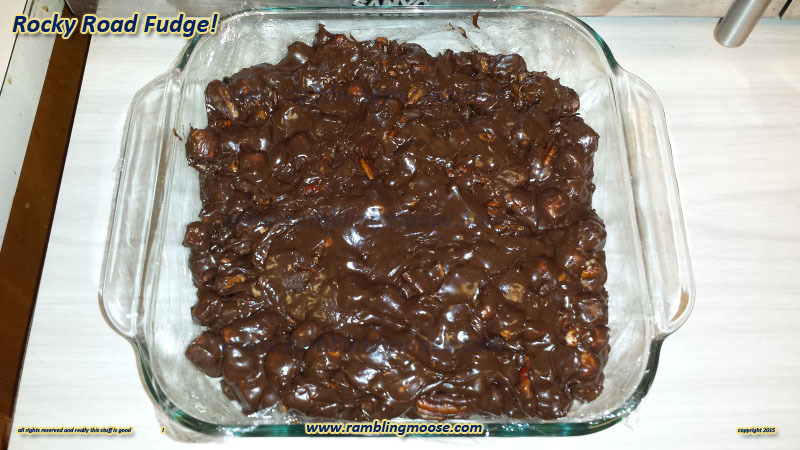 Oh, and the trick with this fudge is it is no cooking needed. Just a good microwave. 1 1/2 cups of nut pieces. I recommend Pecans. I love Pecans in my recipes! Optional - A little vanilla extract, or any other flavors you like! Get a large microwave safe bowl to do this in. Add 12 ounces of Your Favorite Chocolate. It can be any flavor you like. I used Semi Sweet Chocolate. 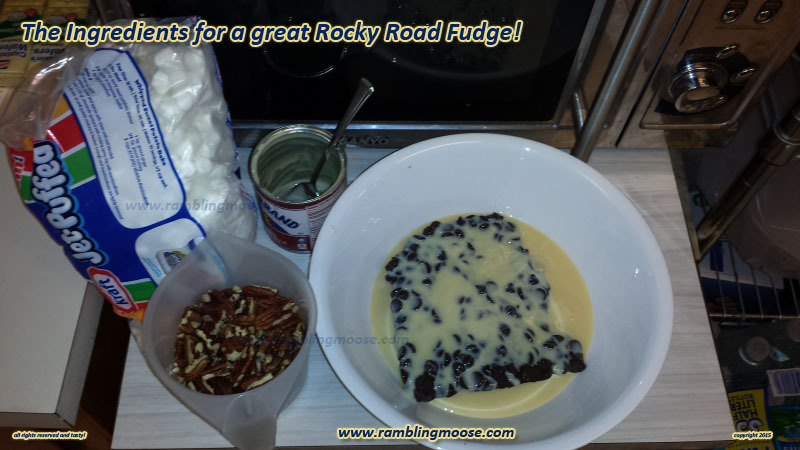 Add one can (14 ounces) of Sweetened Condensed Milk. Place bowl in Microwave and Microwave on High for 60 seconds while watching to make sure it doesn't boil. Stir the chocolate and milk mixture. This is the basis for your chocolate fudge. 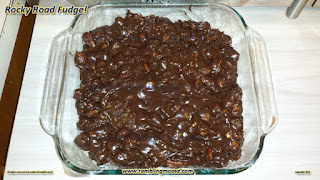 If you just want chocolate fudge, do not add anything more. If the chocolate has not melted repeat microwaving on high for 30 seconds and stirring until the chocolate has completely melted and is silky smooth. Fold in the Pecan pieces and mix until evenly distributed. Fold in the Mini Marshmallows. They should not melt. Chill until set in a lined or greased container. I used an 8 inch square (500 MM) Pyrex container and lined with plastic wrap that I lightly oiled. Now, the bad news. This stuff is rich. But it's also chocolate. I estimate the entire dish to be 4800 calories. That means it serves 16 at 300 calories each piece. But... CHOCOLATE!!!1!! ROCKY!!! ROAD!!! FUDGE!!!11!!! Holy Jumpin' Hannah, is this stuff GOOD!